Alexander Calder was one of the most important American artists of the first half of the 20th Century. A third generation American sculptor, his oeuvre came to fruition in Paris where he lived and worked from 1927 – 1938. There, he had developed a reputation as an unconventional sculptor / humorist. It can be said without qualification that there is a bit of whimsy to be found in all of his work. 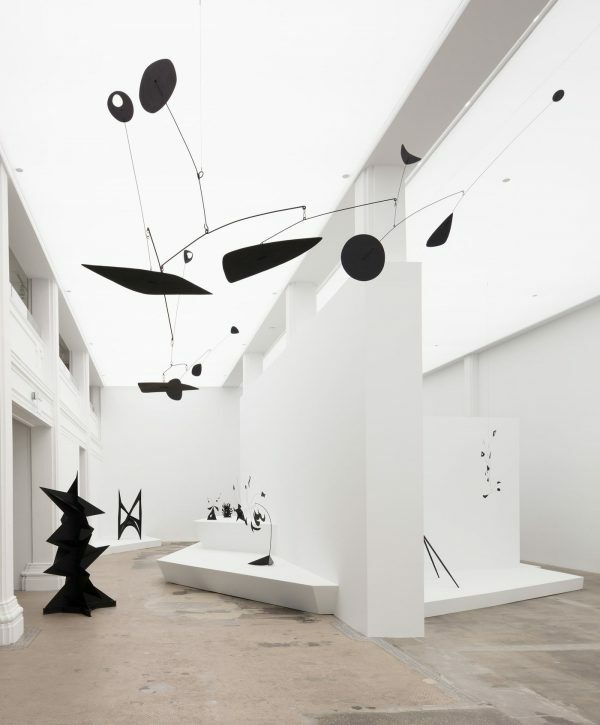 Calder’s response to the surging wave of abstraction that became synonymous with post World War I European modernism was to eliminate figurative representation from sculpture and to animate it by creating two complementary modes of expression: stabiles and mobiles. Stabiles are sculpture that are fixed in position. Mobiles are sculpture in which motion is an essential component of its conception and execution. 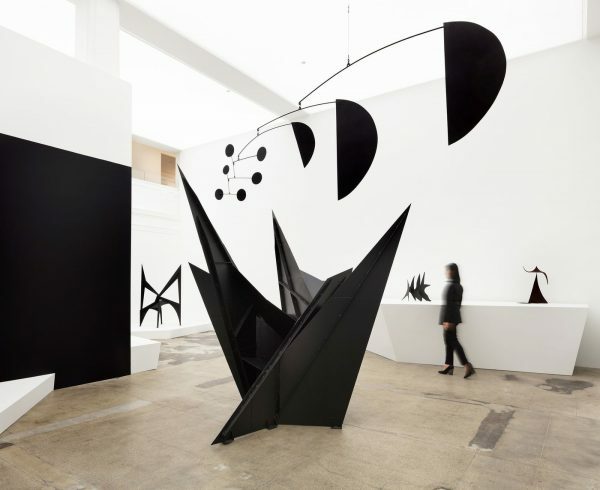 Calder invented the “mobile” as sculpture. 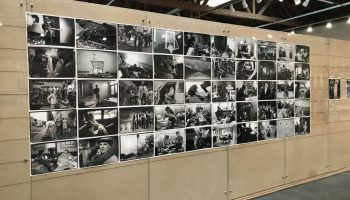 Unfortunately, his concept and methodology have been bastardized by others and become commercial products, rather than artistic conceptions. In Paris, he was in contact with some of the major innovative artists of that time. After meeting Arp, van Doesburg, Leger, Mondrian and Miro, he experimented with abstract painting. He said that he had created stabiles in an attempt to make Mondrian’s paintings vibrate. Previously, he had introduced movement into his art by making his sculptures vibrate and move. His “Circus,” with animated figures was seminal to the development of mobiles. His 1929 mechanical Goldfish bowl lead to the development of simple mechanical devices for controlling the patterned rhythm of moving objects within a fixed frame. Never a member of the surrealists, Calder was, without question, influenced by their revolutionary concepts. It was Marcel Duchamp who coined the term “mobile” to describe Calder’s sculptures defined by movement. In 1964, New York’s Guggenheim Museum presented a retrospective of Calder’s work. My wife Mary and I were fortunate in being able to attend the opening. 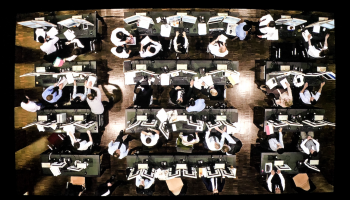 It remains, in my mind, one of the best and most appropriate exhibitions that I had ever seen at the Guggenheim. Sandy Calder was present – a modest, unassuming informally attired small man. I once asked Frank Lloyd Wright, the Guggenheim’s architect, how it was going to be possible to display flat paintings on curved walls. 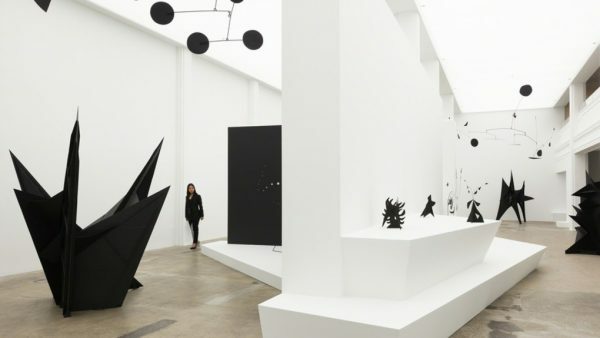 He said, “That’s not my concern.” However, Calder’s sculpture was very appropriate in that space. 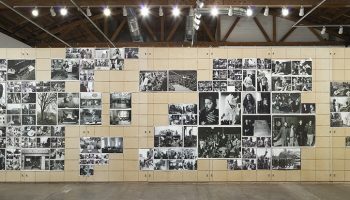 Hauser & Wirth is a commercial art gallery which presents exhibitions of museum caliber. This is certainly one. The objects on display are the property of the Calder Foundation which maintains an extensive inventory of its namesake’s work. Calder was an amazingly prolific artist. He often worked on a small scale preparing models for a foundry in proximity to his studio in Roxbury, Connecticut. At the foundry, he would supervise enlargements. In this exhibition, some objects are described as “maquette,” indicating the they are models for an enlarged work. This exhibition is in no way definitive nor does it purport to be; however, it, without question, offers a beautifully installed carefully selected and informative exhibition of Calder’s work. Not to be missed.